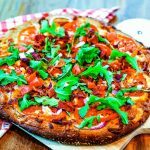 Cheesy BLT Pizza with a garlic-mayo pizza sauce, loads of crispy bacon, red onion, and fresh tomatoes, all topped with nutty arugula, and more BACON! Allow pizza dough to rest at room temperature so that it will be elastic and easier to shape. Slice the tomato into very thin slices and place on a paper-towel lined plate or tray. Sprinkle with salt and pepper and allow to drain for 20-30 minutes. Preheat the oven to 400 degrees. Spray a 12-inch pizza pan with cooking spray and sprinkle with 2 tablespoons cornmeal. Shake off any excess and set aside. Roll dough into a 12-inch circle on parchment paper and transfer to the pizza pan. In a small bowl, combine the pizza sauce ingredients (mayo, olive oil, and garlic), then spread evenly over the dough. Layer the toppings in this order: half the bacon, the red onion rings, and then the mozzarella cheese. Add tomato slices (reserving any extra slices and chop for garnish) and sprinkle with the Parmesan cheese. Bake at 400 degrees for 18 – 20 minutes, or until the crust is golden and the cheese is bubbly. To serve, top pizza with the baby arugula, extra bacon, and reserved chopped tomatoes and chopped onion, if desired. Tried this recipe?Mention @LifeLoveAndGoodFood or tag #lifeloveandgoodfood!